October 16, 2017, 5:00 p.m.
Americans continue to criticize the federal government’s response to the Hurricane Maria in Puerto Rico, a public reaction that is quite different from the positive evaluations of the response to Hurricanes Harvey and Irma. In the latest Economist/YouGov Poll, the public wants additional action – including increased support for Puerto Rico’s financial crisis, which predated the hurricane’s devastation. Only one in three believe the federal government responded adequately or as fast as it could have to the damage on the island. More disapprove than approve about how the President is handling the situation. That was also the reaction last week. 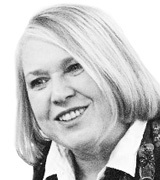 It’s unclear whether or not the island’s status as a territory was a factor in the government’s less-than-praised management. Only 34% say the response would have been faster if Puerto Rico were a state. Hispanics, as well as those who knew someone affected by Hurricane Maria, are somewhat more likely to think that the island’s unincorporated status made a difference. However, most agree that more can and should be done. 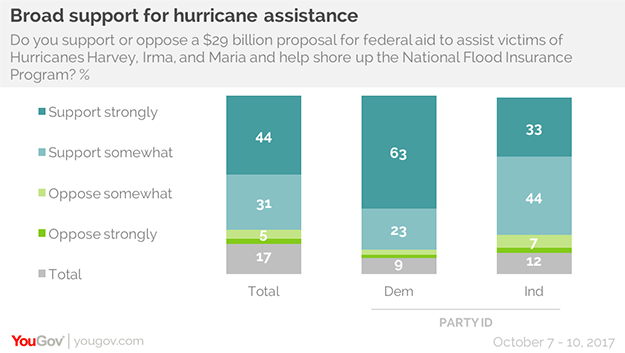 Only 8% oppose the $29 billion proposal to assist victims of the recent hurricanes. And the public is willing to go even further. The commonwealth is more than $70 billion in debt, and the devastation of Hurricane Maria has made the island’s financial situation even worse. Six in ten Americans want the US government to provide financial assistance to Puerto Rico to ease its financial crisis and help it recover. Support for financial assistance has grown dramatically since July, when fewer were paying attention. Only one in four said they had been following the situation then, and only a third favored US financial assistance to help out. Now about half the country say they have been following the financial crisis. Support for aid and assistance comes from across the political spectrum, even from the White House. The President said last week that he believed the government should “wipe out” the island’s financial debt, though later the White House walked that comment back. A majority of Republicans are in favor of helping Puerto Rico get through both the hurricane and the financial crisis. But there hasn’t been much increase in the percentage that would like to see Puerto Rico become a state. Just over a third favor that today. Puerto Rico is about 1,000 miles from Miami, less than half the distance between the state of Hawaii and the West Coast. But, like Hawaii, there is an ocean in between, and one in four Americans see Puerto Ricans as different. Asked whether someone born in Puerto Rico whose parents were also born in Puerto Rico is an American citizen or a Puerto Rican citizen, half answered American. That’s up from 41% in July. 28% said such a person would be a Puerto Rican national, a significant minority, though down 14 points from the 42% who said that in July. More than a third of Republicans and conservatives today say those born in Puerto Rico to parents born in Puerto Rico are Puerto Rican.